Just One More Week to Participate in BC Management's 14th Annual BCM Compensation Study. Only Study Participants will Receive a Complimentary Copy. Study Closes March 4th! BC Management's 14th Annual BCM Compensation Study Closes on March 4, 2016. Only Study Participants will Receive a Complimentary Copy of the Study Findings. Be Sure to Participate Before it's too Late!!! Update your subscription status below if you're interested in any of these positions and didn't receive an earlier notification. BCM Jobs is designed to automatically notify you about jobs that become open that fit your geography, job title, compensation, travel and/or job type. Our monthly job notification, such as this email, ensures that we keep you notified on a monthly basis just in case you leave your selection criteria within BCM Jobs open. Target start date: April 2016. Length of contract: April - December 2016. Possible contract to hire. Travel: Limited travel within the US may be required. A professional services client of BC Management's is in need of a Senior BC Consultant. Scope of project: This consultant will help with business continuity lifecycle. To include but not limited to, Comprehensive business impact analysis and program design, exercise and implementation. The successful candidate will possess strong project management skills coupled with 5+ years business continuity plan development experience. Health care industry experience required. Working knowledge of LDRPS. • Minimum of 5+ years performing business continuity consulting experience highly desired. To apply to this position please visit http://www.bcmanagement.com/search-jobs.html and enter the job number 2929. To learn more about the position, please contact Alicia Stevens - astevens@bcmanagement.com or 562-260-6791. Location: Washington, DC – 60-75% remote travel. * Candidates must have 12+ years overall consulting experience, 5+ years BC/DR practical expertise and proficiency in infrastructure technology areas. Our client company, a large technology consulting firm, is seeking a consultant to fulfill one of their client consulting engagements. Information System Contingency Plan Document Remediation. The Senior Business Resiliency Architect is a key member of the Business Resiliency Consulting Team focusing on the delivery of BC/DR engagements which include Business Impact Analysis, DR Readiness Assessment, DR Design and Implementation and DR Testing Services. The incumbent will also be expected to participate in developing collateral, artifacts, client consumable reports and presentations, and operating / cost models used for the analysis and TCO of the Business Resiliency Program. To be successful in this role, the candidate must have a minimum of 12+ years of overall consulting experience and 5+ years of BC/DR based consulting or practical experience. Ideal candidate will have direct BC/DR process design and deployment experience focused on integrating industry leading Frameworks and relevant methodologies such as ITIL V3, Six Sigma, COBIT, ISO 27001, and ISO 22301 standards as required. In addition, candidate will ideally be able to serve as the Stream Lead in a multi-stream engagement, and will lead workshops, interviews, and presentations during the engagement delivery cycle. It is part of a Change Order for an original body of work which was an Assessment of their DR Environment. To apply to this position please visit http://www.bcmanagement.com/search-jobs.html and enter the job number 2927. Our client, a computer services organization, is seeking a crisis management consultant to work with their Emergency Management Team (EMT) to develop and exercise 9 different crisis/ incident management scenarios. - Work with EMT to review and revamp the EMT documentation. - Design templates for the 9 different crisis/ incident management scenarios. - Exercise each different crisis/ incident management scenario. To apply to this position please visit http://www.bcmanagement.com/search-jobs.html and enter the job number 2925. 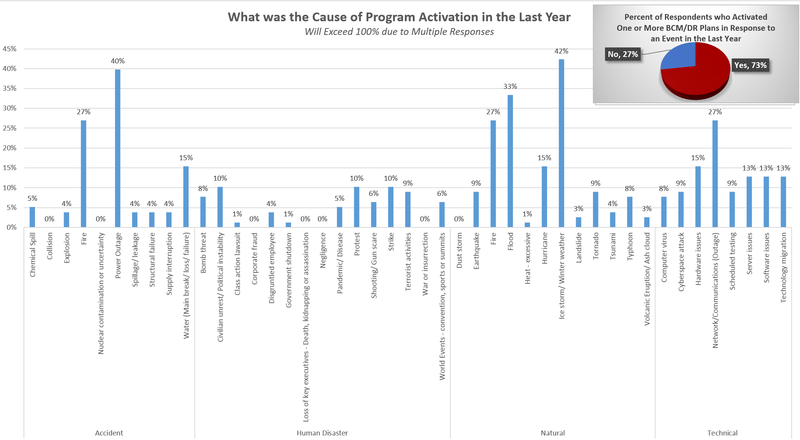 Event Impact Management - Initial Study Results - What Percent of Study Respondents Activated One or More Plans in Response to an Event in the last Year and What was the Event? Just Two Weeks Since releasing our 6th Annual Event Impact Management Study and We're Starting to Assess the Study Findings. Click on the data graph above to view a larger image. Does Experience Developing BC/DR Programs from Scratch Impact Your Earning Potential? The primary purpose of this job is to support the strategy and administration of the Business Continuity Program core components: Business Impact Analysis, Risk Assessment, Program Plans, Program Exercises, Incident Management and Audits to ensure COMPANY’s overall recoverability from disruptions. • Develop working knowledge of, maintain and enhance the Business Impact Analysis (BIA) and annual Risk Assessment. Facilitate BIA and Risk Assessment processes by interviewing senior leaders, developing surveys/questionnaires, writing reports, and developing strategic recommendations and resolution plans for implementation. • Maintain and continuously enhance the Incident Management process and its supporting documentation for the Threat Assessment Team (TAT) and Disaster Recovery Team (DRT). Ensure all information within the Incident Management Plan remains current and relevant. • Support the Incident Management process through active involvement during events, including participating on TAT/DRT conference calls, documenting and distributing meeting minutes, remaining on-call during incidents to provide monitoring and support, and coordinating the distribution of resources, supplies, and other necessary items. • Maintain and enhance all Business Continuity policies and procedures, and coordinate with functional leaders with ownership of interrelated policies and procedures to ensure consistency. Ensure all information within policies and procedures remain current and relevant. • Support the program’s strategic planning, training, drill, and testing processes. Enhance and maintain all templates, plans, reports, training materials, and other documentation. Facilitate simple to complex enterprise-wide exercises and track risks, program gaps and recommended/proposed solutions. • Support the Director, Operational Risk Management in the preparation of requested internal audit and regulatory examiner materials, and liaise with auditors and examiners as needed. Maintain materials for all related steering committees and management committees. • Administer, update, and maintain BC Program tools including Recovery Planner and the Employee Notification System(s), run standard and custom reports on a regular or ad hoc basis, and make recommendations for additional tools when justified. • Bachelor’s Degree in emergency management, risk management, business or a related field is required. • Minimum of five (5) years’ of experience in risk, crisis, business continuity, or operations is required. • This position will mentor employees. • DRII Certified Business Continuity Planner is preferred. • BCI- MBCI certification is preferred. To apply to this position please visit http://www.bcmanagement.com/search-jobs.html and enter the job number 2924. * Seeking consultants with 3+ years expertise in business continuity planning with specific/ recent BIA expertise. Our client is seeking a Business Continuity Contract Consultant to assist on with a BIA consulting engagement in Carlsbad, CA. To apply to this position please visit http://www.bcmanagement.com/search-jobs.html and enter the job number 2923. * Candidates must have recent expertise in a dedicated BC/DR exercise/testing role. • Serve as “Senior Exercise Planner” to support design, development and execution of physical and cyber disruption exercises for the financial services sector. • Responsible to design and develop exercise materials, such as: situation manuals, exercise plans, document after action reports and other such documentation to support meeting and exercise facilitation. • Coordinate project planning for multiple exercises to achieve the goals of the 2016 exercise calendar. • Prepare weekly reporting on exercise program activities. • Perform exercise planning, documentation, facilitation & post analysis duties. • 7 years of experience business resiliency exercising or disaster recovery testing for physical and technology disruption events. • 2 years minimum of project management and team leadership. • Knowledge of FFIEC and NIST standards for business continuity, testing, third party risk management and cybersecurity controls assessment. • Strong organizational and quality controls skills necessary to maintain documentation library expansion, integrity and distribution routines. • Highly developed skills in prioritization with flexibility to expand workload and reorganize priorities. To apply to this position please visit http://www.bcmanagement.com/search-jobs.html and enter the job number 2915. The digital transformation of our societies needs to be grounded in research and requires innovative ways to convey understandable messages about complex issues like enterprise & corporate (cyber) resilience strategies. With more than 35 years of experience, this candidate would be a real asset to your organisation. His areas of expertise cover national security and civil emergency commandment systems, critical infrastructures’ protection & cyber defence, business and cyber resilience and crisis management. He has worked for European institutions, governments, public sector & civil emergency departments, critical infrastructure operators, industries, security & defence companies, ICT firms. As a former CEO of consulting & COTS editing start-ups, he is a sharp decision maker and a business developer. As a strategic consultant, he is a market influencer, renowned public speaker, author and team leader. As an innovation award winner, he creates new decision making technologies, he changes consulting models, and he helps Boards and executives to define their policies about key issues such as cybersecurity, away from usual jargon. His studies on critical infrastructure protection & risk governance, of the cyber risks against future ATM systems, of telecommunications resilience, railway incident management, aviation knowledge management and industrial systems’ cybersecurity certification have been great contributions to EU and national policies. His empirical research about multilevel governance of critical infrastructures' resilience & cybersecurity, new cyber-attack strategies and the dynamics of resilience allow to explore new policies and management strategies. • Business development and Bid management. • Serve as primary corporate liaison with internal lines of business to provide consultation, training and support of business continuity planning process (business impact analysis, risk assessment, plan development and maintenance, exercises and supplier continuity). • Ensure viable recovery strategies and solutions are identified, documented and maintained in support of business requirements. • Plan and coordinate exercises in support of incident management, application recovery and critical vendors. • Provide oversight and support for the exercising of business continuity plans, review results and related evidence for completeness, viability and compliance with policies and standards. • Maintain incident management plan and act as key player during activation. • Identify opportunities and provide recommendations to improve processes through the use of best practices from internal and external sources. • Maintain awareness of regulatory requirements. • Facilitate BCM presentations and prepare reports and management dashboards. To apply to this position please visit http://www.bcmanagement.com/search-jobs.html and enter the job number 2922. * Candidates must have 10+ years or relevant Crisis Management expertise within a large global corporate environment, proven leadership skills managing a global program and a Bachelor Degree. As an integral part of the larger Global Technology & Operations organization, Global Corporate Security (GS) provides integrated security and operational risk management services across several functional areas including Security Operations, Crisis Management, Executive Protection & Event Security, Intelligence & Risk Assessment, and Security Systems and Applications. Along with the rest of Global Technology and Operations (GTO), GS has adopted a strategic-control model across three geographic regions to ensure consistent execution of global security operations, policies, and procedures protecting associates, sites, technology and operations. GS focuses on being proactive - assessing risk, executing appropriate prevention and preparedness measures, and leading the development of planned response to potential disruptions. The Assistant Vice President for Global Crisis Management will lead the Crisis Management function at COMPANY, including the Crisis Management Lead for the Americas. The role will be responsible for the continued coordination, implementation and maintenance of the Global Crisis Management program, associated metrics and all aspects of related technology, training and program development. The Global Technology & Operations area within COMPANY is seeking a New York metro-based crisis management expert with at least 10 years of relevant experience to lead the Crisis Management function at COMPANY. He or she will report to the Senior Vice President of Global Corporate Security and Chief Security Officer. • Improves and maintains the global framework for crisis management. Builds and maintains crisis and incident management strategies and executable plans. • Develops and maintains crisis communications protocols and channels including COMPANY’s mass notification tool and Crisis Management intranet site, among others. • Develops exercise scenarios, training materials and drives crisis preparedness and response awareness content for all employees. • Supports regional security teams during responses to major crises, and coordinates necessary corporate response while informing or engaging the enterprise-level senior management team, as appropriate. • Coordinates with COMPANY’s business continuity, disaster recovery and intelligence teams in proactively assessing risk to prepare for and respond to crises. • Regularly conducts risk assessment of potential crises, identifies significant security and business issues and recommends and executes refinements to COMPANY’s approach. • At least 10 years of relevant experience in developing and operationalizing a global crisis / incident management program in regulated industries. • Strong record of leadership and achievement in global crisis management with proven track record articulating a compelling strategy, developing plans, conducting training & testing, and executing crisis response. • Comprehensive knowledge of crisis management processes and technology, including integration of operations / command centers and related technology and applications into crisis management preparedness and response. • Proven excellent project management and supervisory skills. • Ability to work in a matrix environment and effectively manage through influence. • Bachelor’s degree required. Advanced degree preferred. • Multilingual capabilities a plus. • CBCP or related certification desired. • Thinks Strategically - Sets direction aligned to the company’s strategy, applying external and global perspective to meet local and global needs. • Motivates People - Gains people commitment to achieve business objectives through clear communication of the company’s vision and flexing leadership styles to inspire high performance. • Creates Partnerships - Authentically builds trusted relationships and collaborates across global, diverse and multi-functional teams to successfully drive business objectives. • Grows Talent - Inclusively and pro-actively develops talent, empowers individuals and manages diverse teams to drive engagement and performance. • Drives Results - Sets aggressive goals and is accountable for continuously driving improved performance, leading change and ensuring high standards. To apply to this position please visit http://www.bcmanagement.com/search-jobs.html and enter the job number 2921. Our 6th Annual Event Impact Management Study is now live through March 31, 2016.
Business executive with risk management in my DNA. From Hurricane Sandy to Fukushima to the Ukraine and the financial crisis I have lead, supported and managed risk across public and private enterprises for over 15 years. Experience includes risk management, crisis management, business continuity, emergency management, regulatory and corporate governance and compliance, and program management. Over my career my positions have included serving as a Manager of Enterprise Risk Management for a global financial services firm and as the Business Continuity Manager for a global business information provider. Current responsibilities include serving as the Director responsible for the vision and strategy of a 3.5 million dollar global Business Resiliency Program, with an active client community of more than 1400 Associates, covering 150 sites in 56 countries, and protecting billions of dollars of total insured value.